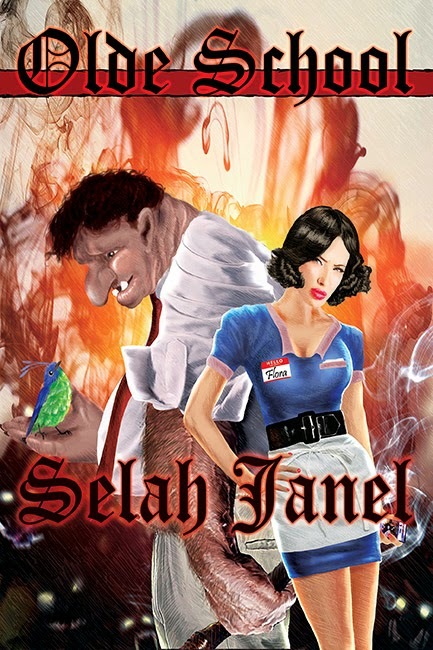 Available Now: Olde School by Selah Janel! As promised, you can get Olde School today on the two main e-book platforms! More will be coming, and paperback will be out next week! Don’t forget, Southern Indiana folk, I’ll be at Evillecon from March 28-30 and I’m at the Alexandrian Public Library March 29 from 10am-12pm. Olde School introduces you to Kingdom City, which has moved into the modern era. Run by a lord mayor and city council (though still under the influence of the High King of The Land), it proudly embraces a blend of progress and tradition. Trolls, ogres, and other Folk walk the streets with humans, but are more likely to be entrepreneurs than cause trouble. Princesses still want to be rescued, but they now frequent online dating services to encourage lords, royals, and politicians to win their favor. The old stories are around, but everyone knows they’re just fodder for the next movie franchise. Everyone knows there’s no such thing as magic. It’s all old superstition and harmless tradition. I’ve fielded some questions on Facebook yesterday, so I want to address a few things here. Yes. That’s pretty much what this book is. It’s fantasy, sure, but there are strong elements of dark fantasy, paranormal fiction, and horror. There are comedic elements (This, more than anything else, probably proves I have a sense of humor). I’d even call it urban fantasy (the urban being a world that just happens to have trolls, dwarves, pixies, etc). All of those are put through a massive fairy tale and folktale filter. There are going to be dark bits. There are going to be bits that probably make you squirm a little, because a hero has to be made before he can start on his journey. He has to go through stuff and hit rock bottom. That doesn’t change if it’s a human, a man, a woman, or a troll. The stories this incorporates aren’t pretty and I’ve made no attempt to clean them up. That being said, I think you’ll also find a lot to smile over and a lot to laugh about. Here’s the thing, though. This is not Grimm. This is not Once Upon a Time. This is not anything else out there. While there are some obvious references, I strive really hard to mix in elements of the stories that are not widely known. You’ll meet Katie Woodencloak here, and Allerleirauh, and some others that are original but have their root in very, very old stories. Not that I have anything against more typical fairy tale modernizations, but truthfully, it’s not right to compare apples and oranges, so why bother? This is a very special blend of a lot of elements that are deconstructed and put back together to form a very unique world and a very unique story. Really, though, the best way to find out what Olde School is? Read it!